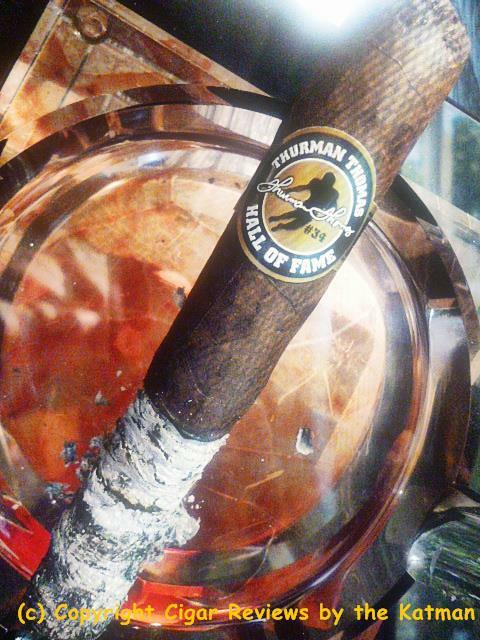 Pro Football Hall of Famer Thurman Thomas has hand-picked an exclusive collection of cigars that are unlike any other. Meticulously selecting from his own humidor his personal favorites, he has created an elite collection exclusively for StogieBoys. Handmade in the Dominican Republic by the highly reputable General Cigar Company, these cigars are masterfully blended with quality Dominican long-filler tobaccos. 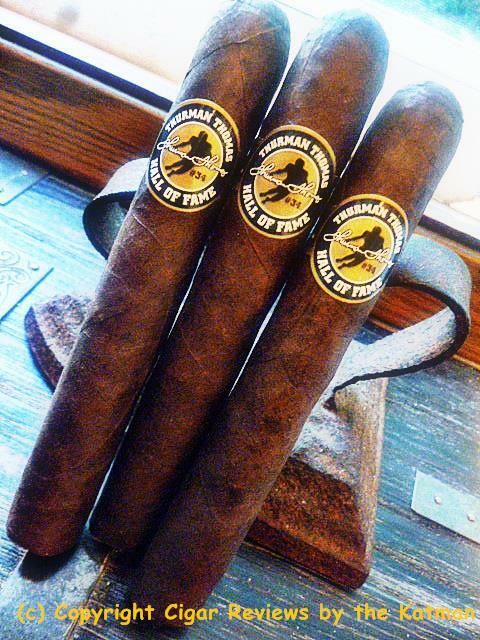 They are covered in a rich, dark Maduro wrapper that creates a challenging medium-bodied smoke with plenty of flavor. 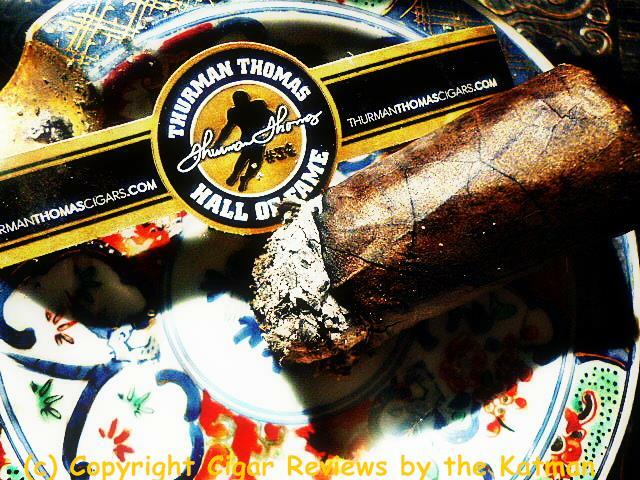 Today we take a look at the Thurman Thomas Hall of Fame Maduro. 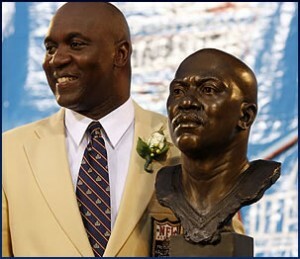 “Thurman Lee Thomas (born May 16, 1966) is a former American college and professional football player who was a running back who spent most of his National Football League (NFL) career with the Buffalo Bills. Thomas was elected to the Pro Football Hall of Fame in 2007 and into the College Football Hall of Fame in 2008. 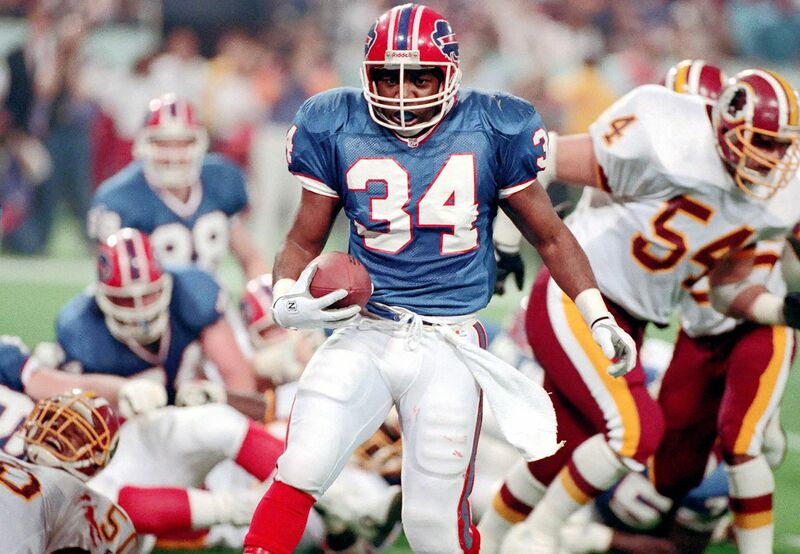 “Thomas was an important part of the Bills “no-huddle offense” that won 4 consecutive AFC championships, but the Bills fell in the Super Bowl every year…and was named NFL’s Most Valuable Player in 1991, after becoming the 11th player in NFL history to finish a season with over 2,000 all-purpose yards. Now I know what you all thought when you saw the name of the cigar. We experienced smokers smell something fishy when there is a match up between a celebrity and a cigar brand. In most cases, the cigar is inferior in every way. The expensive Ditka series of Camacho is a total bust. I reviewed them here. And I wouldn’t have reviewed this cigar if I hadn’t tried it first. I am happy to announce that the Thurman Thomas blend blitzes every other celebrity collaboration. that you do so well. that nobody else could do! 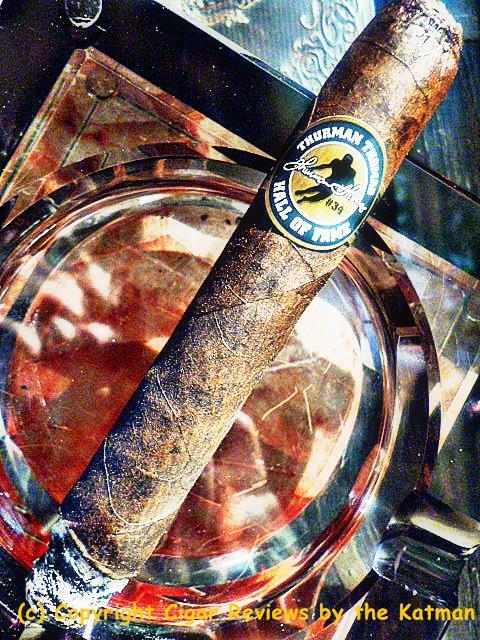 This cigar is designed to be a premium stick that you can smoke all day long. It is affordable and allow me to let you in on something….I smoked one yesterday, on a fresh palate, and I enjoyed it immensely.. So the voo doo is out of the bag. I’ve had the cigars a little over a week; did my Dry Box thing and then put them in my low humidity humidor. It seems that one doesn’t need to wait months and months for this blend to be ready to smoke. I like that. Based on what I smoked yesterday, I think you, my lovely readers, will thoroughly enjoy the Thurman Thomas Maduro. So on with the review…. The TT is a solid stick without soft spots. It is a little out of my comfort zone as far as big honker size but that being said, it is a very nice looking stick. I love the mottled dark coffee bean color to the wrapper…which also has a slight reddish tinge. It has a nice oiliness with lots of tooth. I clip the cap and smell aromas of dark chocolate, fudgy chocolate, CHOCOLATE!, spice, herbal notes, red pepper, earthiness, sweetness from honey, nuttiness, cedar, and leather. First puffs are CHOCOLATE! Man, the cocoa flavors are potent, bold, and delicious. There is a lemony citrus flavor. It is extremely earthy and full of peat. There is a nice salty pretzel element. The strength begins at mild/medium. I’ve only burned ¼”. The draw is very good with a clean aftertaste. Nuttiness appears which supplants the salty pretzel. The red pepper shows itself. Building very slowly at first and rising, rising, rising until it is made the tip of my tongue numb. I like that. I’m a fool for spicy cigars. I can taste black tea in the background. At 1” burned, flavors coalesce. The cigar does not try to hide behind the cross reference of football player vs. cigar. 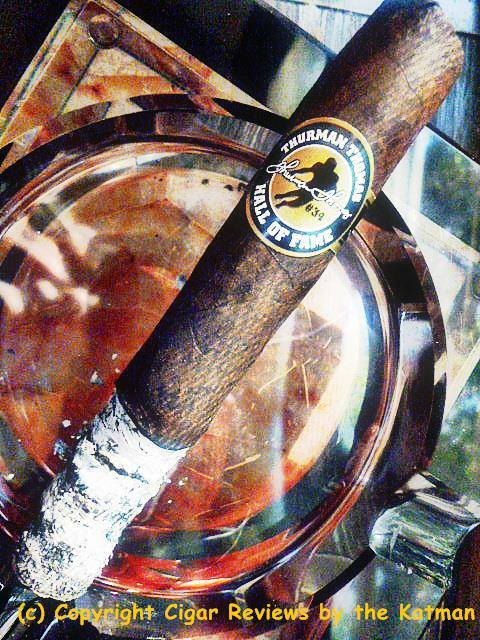 The Thurman Thomas Hall of Fame Maduro is a good cigar. And the price is right. I’ve smoked two of the Camacho Ditka blends are they were crap. Not to mention the crazy prices of $12.50 and $10.00 for each blend. So far, this $4 stick is better than the Ditkas. I have to clarify this statement. This is a good inexpensive stick that you can smoke as often as you like. Not on special occasions. It has a bit of old school blending techniques to it and I recommend that the sticks be given a month or two of humidor time…not the week that I gave it. But I am the master of discerning potential in a cigar. Like Hansel and Gretel leaving bread crumbs. I am the guy that finds them. And I like what I find because of the heavy dose of chocolate. The ancillary flavors are perfect matches for this blend. Without any gymnastics from me, the ash is hanging tough at 1-1/2” and not seeming to want to budge. And the char line is dead nuts perfect. I near the end of the first third and the flavor profile of the Thurman Thomas Maduro finds a broader spectrum. Creaminess enters. I get a tangerine flavor that dismisses the lemony citrus flavor. The strength is classic medium bodied now. The finish is very long and chewy. It is too soon to say whether the cigar will become complex but if it does, it will happen in the last third. My gut tells me the real sweet spot will occur then. But if it doesn’t, another month of humidor time will cure that. General Cigars worked with Stogie Boys on developing this cigar. But I don’t know how much input Thurman Thomas had in the blending of the cigar. The second third begins and things hop to it. The pepper is strong. The chocolate, creaminess, nuttiness, tangerine, earthiness, and leather are pumping. Damn. 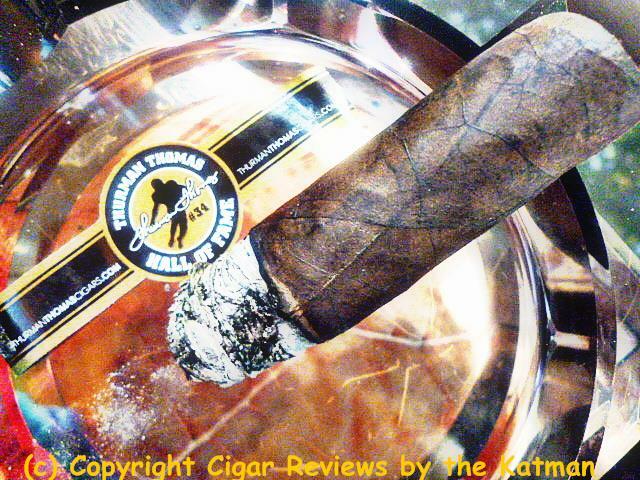 The Thurman Thomas Maduro makes a major transition now….the flavors are very near flavor bomb status. The one I smoked yesterday didn’t have that kind of impact on me. This cigar’s blend now belies the $4 price tag. I didn’t expect the blend to get this good for another 30 minutes. The herbal notes become very strong as well as the black tea flavor. The dark chocolate and the creaminess absolutely steal the show. It is the epitome of a chocolate milk shake. There aren’t a lot of subtle flavors. They are bold and right up front. Don’t forget that my readers only get a special 10% discount on any Thurman Thomas product, any size or count, by using the coupon code of KATMANTT during check out. Shipping is reasonable at $5. I am dead center at the halfway point of the Thurman Thomas Hall of Fame Maduro. This is a very flavorful cigar. A great everyday smoke. One you can hand out to your mooch friends who will be impressed with the Thurman Thomas name. Both the Natural and Maduro versions come in the one size only: Toro 6 x 52. The last third is definitely the sweet spot for this cigar with only a week of humidor time. Here are the flavors one last time: Chocolate, creaminess, spice, tangerine, black tea, nuts, herbal notes, earthiness, cedar, and leather. The construction has been terrific. Not a single touch up required. Only one clip to the cap to hid the Katman drool, and not a single issue with the wrapper. The Maduro sweetness is earthy and fruity. Like me. I want to thank Sheryl King at Stogie Boys one more time for having faith in me and sending me samples for review. 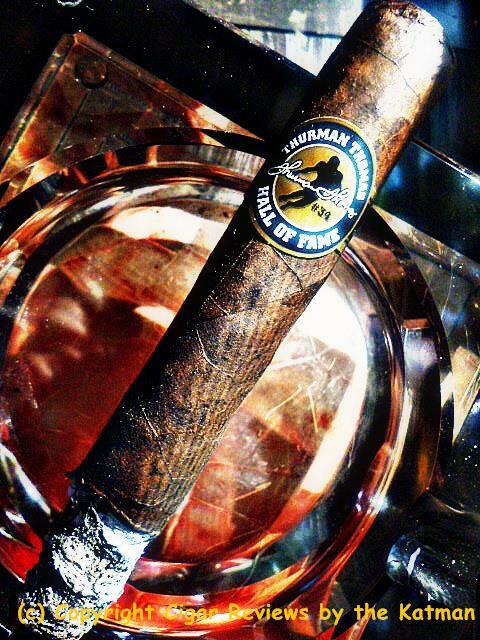 The Thurman Thomas Maduro is a perfect match. Flavors are absolutely soaring now. The strength is still classic medium. Not a lick of nicotine. A cigar that both experienced enthusiasts and newbies together can enjoy. It is not too strong for newbies and will sate the needs of the experienced aficionado due to the expansive flavor profile. As the cigar finishes out, the red pepper shoots for the moon. While the cigar does not become complex, I attribute that to the lack of humidor time. In a month, I will return to this review with an update. The cigar is delicious. I love sticks that are heavy on the chocolate and creaminess. The last 1-1/2” is just a monster flavor bomb! If you aren’t sure, Stogie Boys sells 5 packs and even singles. And the KATMANTT code still works. Last thoughts…It is hard to believe that the price point is so low. Based on everything I’ve ever smoked, this could easily be a $6, or higher, cigar. So kudos to Stogie Boys for keeping the price point affordable. Sheryl also sent me samples of the Head Hunter Habano 5.5 x 62 Belicoso Gordo. Another inexpensive brand blended by MJ Frias Cigars of Santiago. Dominican Republic. I look forward to reviewing this stick. Another $4 stick that comes in Habano and Connecticut and is medium bodied. And lastly…Don’t forget about the contest we are holding courtesy of Stogie Boys. 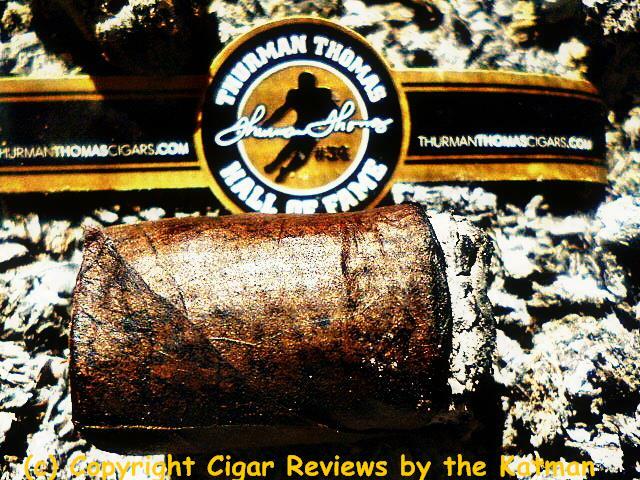 You can win a beautiful Thurman Thomas Hall of Fame Maduro Gift Setworth $110. Click on the link to enter. The winner will be chosen by Sheryl King on September 3.